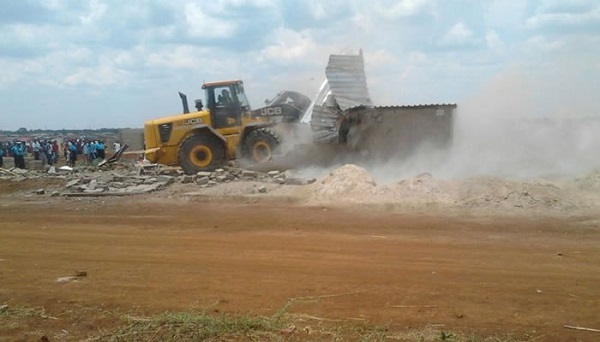 ZIMBABWE – Harare City Council yesterday demolished 200 illegal structures along High Glen and Kambuzuma roads whose owners belong to 32 bogus housing co-operatives. Council officials said the houses were built on State land meant for a hospital and other amenities. Some people whose illegal structures were demolished said notices were sent six months ago by the council ordering them to vacate, but they ignored because cooperatives representatives promised to liaise with council. The illegal settlers claimed chairmen of the co-operatives that had formed Stars Consortium, who could not be contacted as they vanished from the scene, had told them to ignore the notice. “We are devastated because of the situation. Yesterday we were told to move away and that we should have registered with council before we built our houses. When we received the notice to vacate, the chairman of our housing cooperative (Chronicle Housing Cooperative) assured us that all was in order and that they were regularising our stay. Now we have been left homeless and I have no idea where my family is going to stay,” said Mr William Sanganai who said he belonged to the unregistered Chronicle Housing Co-operative. The city’s principal communications officer, Mr Michael Chideme confirmed the development. “Harare is on a drive to preserve its wetlands and will not tolerate unplanned settlement,” he said. Mr Chideme advised Harare residents to desist from buying land from individuals or cooperatives without consulting the council for vetting and approval. Harare Mayor Bernard Manyenyeni said they were protecting the city’s town plan. “We are very keen to protect the city’s superior town planning and in doing that, we discourage any form of unplanned settlements. Where this has gone ahead without authority, we first seek to regularise as many of the structures as we possibly can,” he said. He said council would only destroy structures where people become reluctant to regularise. “If regularising fails we encourage the affected people to relocate themselves, failing which we undertake demolitions only as a last resort and this must be done as humanely as can be,” he said. “The other sore aspect is that in most cases the victims will have been misled by pseudo-authorities land barons, including some of our staff — quite easily. “The sight of women and children being harshly displaced is not a good one to observe, no one must be seen to be enjoying this painful process,” said Mayor Manyenyeni. He said they had received mixed feelings over the demolitions with one side calling for ruthless enforcement and while the other pleaded for the victims. In August this year, Government announced that it was introducing a new housing scheme to protect the public from land barons that have fleeced them of millions of dollars through illegal sales of residential stands on undesignated sites. Local Government, Public Works and National Housing Minister Saviour Kasukuwere directed local authorities to indicate their land requirements to the Government to facilitate their fulfilment of targets under Zim-Asset. The Own-Your-Own-Home Scheme sought to meet targets set under Zim-Asset. Under Zim-Asset, the Government expects to provide up to 300 000 residential stands by 2018. The scourge of illegal settlements precipitated by the activities of the land barons and the non-development of land by housing cooperatives and land developers has necessitated Government to introduce a new housing scheme known as Own-Your-Own-Home Contributor Scheme to meet Zim-Asset targets. The scheme would be anchored on member contributions to leverage finance, while the ministry would provide the land and infrastructure services. The ministry has since tendered for the supply of plant and equipment for the development of land. Minister Kasukuwere said the Government was aiming at offering people affordable accommodation. “It is a programme that is meant to give people a chance to have decent accommodation that is affordable. “We are already engaging private contractors to clear the land countrywide,” he said. Government this year embarked on a crackdown against land barons who have been illegally selling State and council land to unsuspecting members of the public. A number of people have lost their money in such deals, with 8 000 having reported their cases to the police 15 suspected land barons have appeared in court or under investigation.